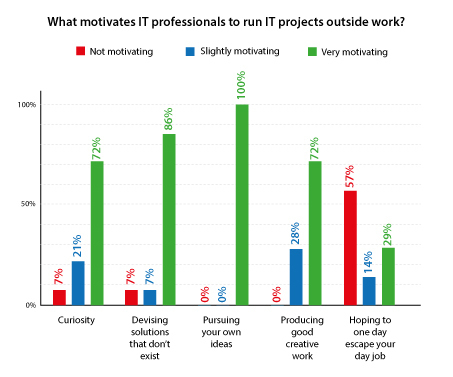 New Research: What Motivates Ultra-Keen IT Pros? If you straw poll people on what they would do with themselves if they didn’t have to spend all day at their real-life place of employment, you’ll find the results quite varied. Many people will speak vaguely about “travel” or “reading”. But quite a considerable volume, will list activities that consist of actual work. And for some that work is almost the same as the stuff of their day jobs. Think of all those would-be 90,000 word novelists, eight-by-four foot oil painters, or multi-level computer game programmers. Really, there is no denying these activities will be a bit of a slog, even if they are a labour of love. And for many, these tasks (very) loosely constitute what they do all day. The interesting thing about all this is it can be interpreted in a number of different ways. Because while a great many people are employed in a field that has absolutely nothing to do with what they actually like – others love the principle of what they do, if not the practice. While others still, love it all so much they want more… even in their free time. Take all those wannabe novelists, artists, game designers out there. Many of these are, in fact, graphic designers, copywriters and developers, paid during the day to produce corporate words, pictures and IT interfaces. But maybe it is just not the same as running your own creative project? It is important to remember, of course, that for great swathes of the “I’d love to write a computer game” brigade, it is all just wishful empty chat, dependent on that all-important pay packet. Yet for others it is a whole way of life. 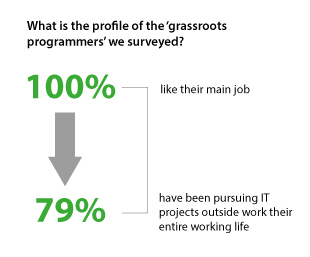 This is why the grassroots programmers fascinate me so much – this is my term for the IT professionals who consistently work on additional IT projects outside work. And these are precisely the people who put their money where their mouth is, to wield a cliché. Or perhaps, more fittingly, they put their time where their mouth is? Back at the start of October we caught up with a few individuals to discover what motivated them to pursue extra IT projects in their free time. Then as a follow up we ran a short survey to a straw sample of 24 of these global IT professionals to generate a bit more insight. We’ve summarised the results below. Firstly, these findings are extremely limited, on top of which, of the small number who took part only 14 elected to answer the specific motivation questions. It is important to stress these can hardly be taken as conclusive proof of anything. Interestingly though, the majority of people we spoke to held very senior positions in organisations. There were a number of IT Directors, and respondents’ length of time within the industry ranged from six to 54 years. Although the overwhelming majority (the mode) had around 20 years’ experience. In short, these were highly seasoned, successful IT professionals and although a 100% of them liked their main job, an incredible 79% had been pursuing IT projects outside of work for their entire working life. When we asked individuals to rate how much a range of different factors motivated them to purse their own IT projects, we discovered “hoping to one day escape your day job” was the least motivating factor. Conversely, the most motiving factor was “pursuing your own ideas” followed by “devising solutions that don’t exist”. “Producing good creative work” and “curiosity” were fairly motivating factors but not as much as the other two. Through these responses and those of the people we’ve caught up with over the last couple of months the overarching message is that these are individuals with enquiring minds who like to mess around with kit, figure out how things work and produce useful solutions. 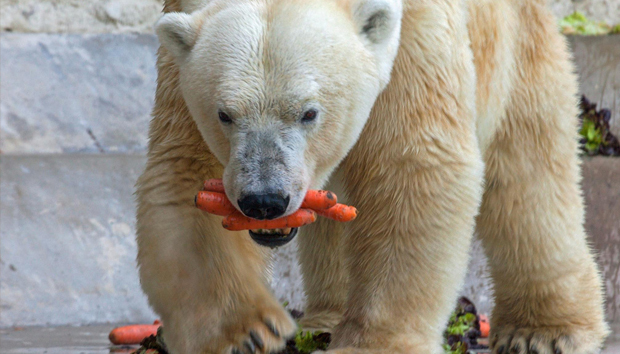 Most people are in it for the long-term and they are not looking to escape their day job. 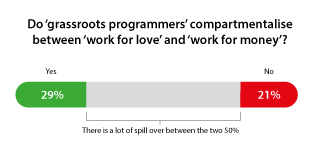 In fact, less than a third actively compartmentalise between ‘work for love’ and ‘work for money’. Interestingly, this is the same number who do see leaving their job as something of motivating factor in all these efforts. It is hard to draw any serious conclusions from a small sample study like this one. However, it does provide a tiny glimpse of insight into what motivates people to pursue projects outside work for the long haul. Maybe these really are the obsessive workaholics who give IT a bad name? The people who are so suited to their job and so ultimately in the right place that they pursue their own projects off their own bat. It is hard to tell as the numbers are so miniscule… yet I can’t help wondering if the same rules apply to all those aspiring novelists and painters out there.